Okey doke, I got my act together for my potato pancake dinner. I made the applesauce when I got home last night from lights, and I made the potato pancakes when I got home tonight from work. I'm not vegan anymore, not that I wasn't a pretty poor vegan, so here again are deveganized potato pancakes, which is to say, potato pancakes. And they're not paleo either, if you keep track of such things. Peel, core, and cut up the apples into chunks. Put the apples into a saucepan with just enough water to cover and cook uncovered over medium high heat until the apples are soft. Mash the apples, add the sugar and lemon juice, and refrigerate until needed. Peel and cut up the potatoes and onion into chunks. Grind them together in a food processor, in batches, until fairly fine. Transfer to a large bowl and add egg, matzo meal, and salt to taste. Heat oil in a heavy skillet over high heat. Drop heaping tablespoons of potatoes into the hot oil, fry for about two minutes per side, and drain on paper towels. 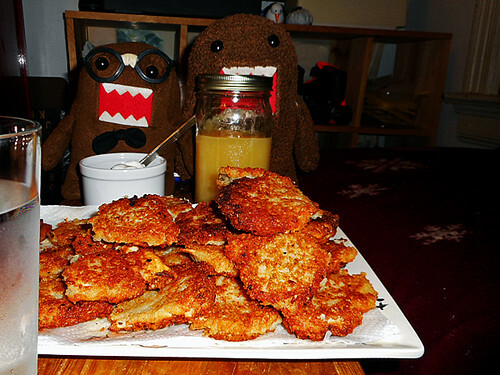 Eat potato pancakes topped with sour cream, or in this case greek yogurt, and applesauce.